‘Life in a Day‘ is an extremely eclectic program spanning the baroque all the way to the music of 2015. We present arrangements of well-known classical works by Bach, Schumann, Ravel, Debussy and Faure alongside newer works by Australia’s own Matthew Hindson, Stuart Greenbaum and a world premiere by Australian jazz piano legend Alister Spence. 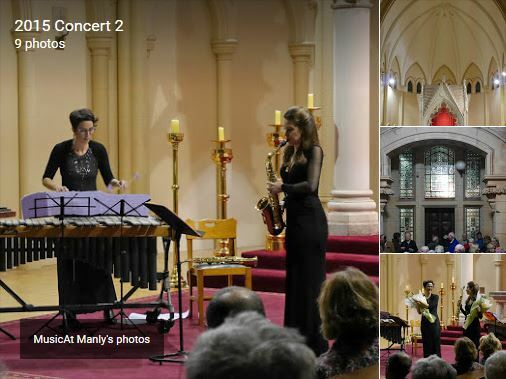 When designing this program we wanted to take a snapshot of our favourite musical moments and present them in one concert on our slightly unusual combination of saxophone and mallet percussion instruments (marimba and vibraphone). We invite you to join us on this journey of surprises – some old favourites, some uncovered treasures and some brand new sonic wonders – who could ask for more? Amy Dickson and Claire Edwardes are both winners of the ABC Young Performers Awards (2004/1999). Having performed together in the UK at the 2005 Cheltenham Festival when Claire was still resident in Europe, the two are reuniting with performances planned in Australia for 2015. Recognised widely for her remarkable and distinctive tone and exceptional musicality, Amy Dickson has performed throughout the world, in venues such as the Wigmore Hall and the Sydney Opera House. She has also performed as a soloist with many orchestras including the Sydney Symphony Orchestra, the London Philharmonic Orchestra, the Philharmonia Orchestra, the Royal Philharmonic Orchestra and the Vienna Chamber Orchestra. An exclusive recording artist for Sony Music, Dickson has now released three critically acclaimed recordings on theSony Music/RCA label. A passionate advocate of new music, Dickson has premiered and been the dedicatee of works by Peter Sculthorpe, Ross Edwards and Huw Watkins. She is proud to be the International Ambassador of the Australian Children’s Music Foundation. CLICK HERE for Concert 2 Programme.